Welcome to the August 2013 Natural Living Blog Carnival: Living Sustainable. This post was written for inclusion in the monthly Natural Living Blog Carnival hosted by Happy Mothering and The Pistachio Project through the Green Moms Network. This month, our members are talking about steps their families have taken, or hope to take, to live more sustainable We hope you’ll find inspiration for your family’s journey towards sustainable living, and share your tips with us as well! Honestly, I kind of just fell into living sustainable by accident. I never consciously made a decision, “I am going to be AS GREEN AS I can be!” But, I guess from an outsiders look, well, my family is pretty darn “Green”…and proud of it. The things my family does is actually because it helps in our attempt to live healthier; gluten free, non GMO, and reducing our exposure to chemicals. In the process of trying to live healthier, we accidentally started living more sustainable, BONUS! We buy all our meat, veggies and fruits from a local farmer at the farmers market every week. The farmer, Mark, is going to be giving my family a tour soon of his entire farm! We have visited it to buy products, but not the actual grounds and crops! My boys will love it and they can see where the food is actually coming from. We use reusable products for pretty much everything: grocery bags, water bottles, snack bags, lunch containers. We use cloth diapers and cloth wipes. This one is my personal favorite! Cloth diapers will not end up in landfills, no drives to the store for diapers, and no chemicals. I think this one is obvious, we recycle. More importantly we teach our kids about the importance of recycling. We buy and use energy efficient appliances. Bonus this saves us money on our energy bill! We line dry laundry when it’s sunny and I have time. We purchase most of our kids clothes from either Ebay or a local consignment shop. First reason for this is because I like to be thrifty, and second reason is it’s good to reuse! We make a conscious effort (OK I think about this one) to try and buy products that are made out of recycled materials. My husband and I plan on building a new home in a few years. This will be a “green” home! On my wish list for it: big backyard for a garden, geothermal air conditioning, some solar power, Rainwater Collection System, and I add to the list all the time. Hopefully, we will be able and have enough funds to complete everything on my wish list for the new house! Oh, I’ve always dreamed of building a green home too. How exciting! Can’t wait to hear more about that. I too would love to build my own home but I love my current one so much I am not sure I would want to move out! 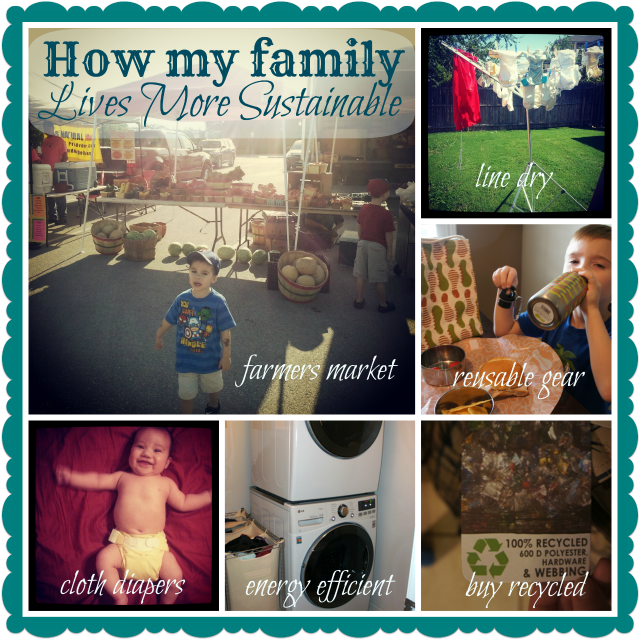 Love your photo illustration of living sustainably. Great job! An eco home is a dream we share as well! These are great ways to be sustainable! Like you, I just sort of fell into sustainability. Never was a “save the earth” type girl but I love the added bonus for living naturally. Jealous of your dream green house! I’ve got lots of plans that I’d love to have in a house but they won’t happen do to where we live and circumstances. Your new home sounds wonderful! What great ideas! A green home would be great! We do a few “green” things like cloth diaper and have a garden but we really need to work on being more green. Sounds like you are doing great and what a wonderful example you are setting for your children! Building a green home is a dream of mine too! Baby steps, baby steps, baby steps… but we’re getting there. Awesome list, we too snag our clothes from consignment stores/ thrift shops for the same reasons. It’s frugal and resourceful! I would love to build a green home, unfortuntely it is just not in our budget right now. This is great! Sometimes its good to take stock of all the good you are actually doing. Also, your list gave me some great ideas for other things I could be doing. I get my clothing from clothing swaps I do 4 times a year with my friends. Great Nikki! The small things do add up!